Dance Mogul: What is the purpose of Hangzhou in Hollywood? Suki Cheung: The Hangzhou Tourism Commission wanted to spread the word about Hangzhou as the best travel destination in Asia. We work out this offline event for them as the venue is close to the red carpet. 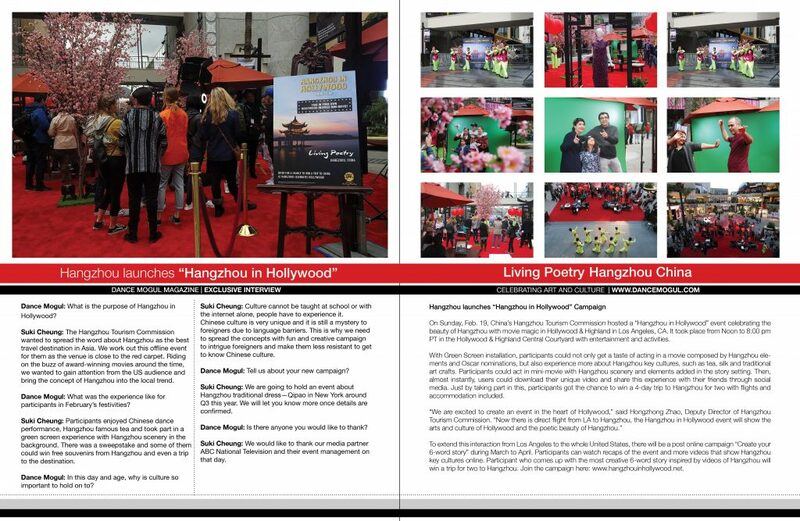 Riding on the buzz of award-winning movies around the time, we wanted to gain attention from the US audience and bring the concept of Hangzhou into the local trend. Dance Mogul: What was the experience like for participants in February’s festivities? Suki Cheung: Participants enjoyed Chinese dance performance, Hangzhou famous tea and took part in a green screen experience with Hangzhou scenery in the background. There was a sweepstake and some of them could win free souvenirs from Hangzhou and even a trip to the destination. Dance Mogul: In this day and age, why is culture so important to hold on to? Suki Cheung: Culture cannot be taught at school or with the internet alone, people have to experience it. Chinese culture is very unique and it is still a mystery to foreigners due to language barriers. This is why we need to spread the concepts with fun and creative campaign to intrigue foreigners and make them less resistant to get to know Chinese culture. Dance Mogul: Tell us about your new campaign? Suki Cheung: We are going to hold an event about Hangzhou traditional dress—Qipao in New York around Q3 this year. We will let you know more once details are confirmed. Suki Cheung: We would like to thank our media partner ABC National Television and their event management on that day.